My existing website: [login to view URL] - keep the logo. 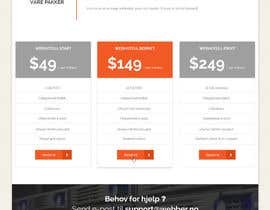 This is hosting business and I only have SSD-shared-hosting that costs more than normal hosting. So feel free to use stock-images of SSD, network, power, speed etc in your design (I can pay for them). This contest is Bootstrap-design: If you win with your drawing/design-idea, provide one frontpage in html/css and one inner-sub-page (bootstrap). No WordPress involved. I have attached an idea in "[login to view URL]" - feel free to rotate the content and reduce colors and improve the design - it is in random order and with things I threw at it. In "[login to view URL]" you will find the background I want for it as well (same as you can watch live at URL below). But you migth not have to do many things to it also - it depends. If you just would clear up my design, it COULD be enough to win. I have purchased this template that I like, because I considered using it instead of having a bootstrap-template: [login to view URL] - so you can use design elements from this template. NOTE: While that is a WordPress template, THIS contest is just about a html/css-version coded using the Bootstrap helper tool (so that I can easy add bootstrap-elements later and also it makes development easier for you I think). Remember to choose orange and boxed-layout-design to get closer to the attached files. I do not want any css-files from the template itself (to keep the source clean and tidy, you can of course open a text editor and borrow code into bootstrap-css). Keep the font used in this design/template - I'm very, very happy with the font, font-size and the font-color. I want to have exactly that font. Keep boxed layout throughout the page. Reduce colors. I do not want any bigger banner/header area than the one in my drawing, but I can accept smaller. But I do want two hosting-related content in it (standard bootstrap-slider is fine I guess). Feel free to experiment: Move the orange header under the logo for instance. And make room for lot of text - less is more when it comes to design-elements - I don't want completely boxed everywhere. I want it simple/clean, but simple is almost more difficult. I do not need any animations that pops up from left or rigth or things like that. Should be mobile friendly and good/small html/css. I like headings with font as in the template and I like headlines with a orange line under it (also seen some places in template online). is the content have finish since you have choose winning entry? I promised to make the contest guaranteed once I got one good start-design, and now there is one. So contest is now guaranteed. You have given the link for wordpress template. 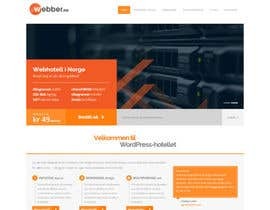 Do you need to build the site in wordpress or we can do the design in HTML/CSS only? Please read the last line in the competition. what kind inner page should made? blog? or any more spesific page? does the inner page need sidebar? It would be good if the inner page contained a very simple sidebar, it can be 100% like this: http://wp-demo.indonez.com/Epicon/blog (the category-sidebar). The only thing missing from that page is a headline and some article text just before the blog-entry examples. There doesn't need to be any other content than that on the inner page, it uses the same header/footer as frontpage (withouth the banner). So just "HeadlineThis can be an article text about blablablablababl" (using the fonts/font-size/colors as used everywhere else in that template, the headline with a little orange under it). It will be in Norwegian. You can use text from any of my norwegian websites: wbber.no or wp-hotellet.no.